Thaye Dorje, His Holiness the 17th Gyalwa Karmapa, is to visit Nepal in May 2015 to lead some important events. 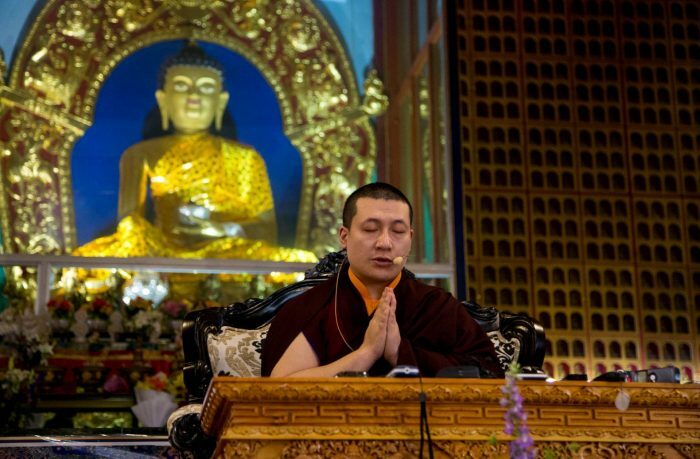 From 25-28 May, Karmapa will inaugurate Dhagpo Sheydrub Ling, the new monastery of Sherab Gyaltsen Rinpoche. Sherab Gyaltsen Rinpoche is a highly respected master of the Karma Kagyu lineage. He is known as a maniwa, an honorific title for a Buddhist teacher who has led others to repeat the mantra of Chenresig at least one billion times. On 31 May, Karmapa will go to the Shar Minub Institute in Kathmandu for the one year anniversary ceremony of the passing of His Holiness Kunzig Shamar Rinpoche. The 14th Shamarpa, Mipham Chokyi Lodro, passed from this life on 11 June 2014, in Germany. From 2-8 June, Karmapa will lead aspiration prayers for the swift return of his teacher and Karma Kagyu lineage holder Shamar Rinpoche. UPDATE: Due to the tragic earthquake and ongoing difficult circumstances in the region, this program will not take place in Nepal. When the location for the ceremonies to mark the one year passing of Shamar Rinpoche is known, details will be published on karmapa.org.